Snake repeller broadcasts vibrations and sounds that are perceived by the snake to be a warning signal of an approaching intruder. By their nature snakes are shy and prefer a quiet location. The perception of moving animals around is enough to keep them away. Waterproof- designed for outdoor use - portable- take it camping! An environmentally friendly way to deter snakes. 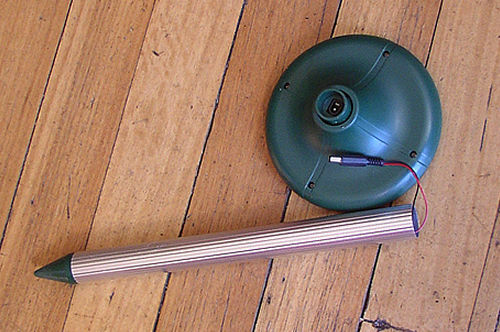 This snake repeller emmits both a low frequency sound above the ground, and a vibration through the ground. Every 30 seconds, the snake repeller fires off, and vibrates for 3.5 seconds. Snakes find this disturbing, and will vacate their homes if they are within the 30 mtr range of the snake repeller. The snake repeller makes a noise so you know its working when its vibrating. This makes it easy to tell when its going, and also tends to frighten off stray animals at night. Do NOT use the aluminium spike (shown opposite) to make your hole in the ground. 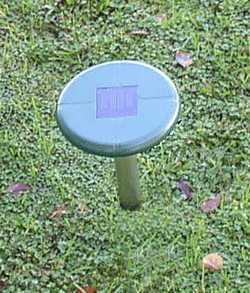 Find a pole of less than 30mm to drive into the ground down about 20cms. With the snake repellers top removed, now push the aluminium pipe into it- as shown opposite. Firm contact with the surrounding earth will give best results. Unscrew the undePull the wires out from the pole and plug into the underside of the top panel. You will hear a noise if its all working. Push the head onto the spike firmly- never hit it with a hammer! IMPORTANT: When you first install the snake repeller, keep your kids and pets indoors for at least an hour. Nearby snakes will be flushed out from their hiding places and seek shelter elsewhere. Don't risk your life trying to kill them with a spade! Place your snake repeller so it acts as a backyard sentinel. Snake repeller will work best in compact soils. With the 2 snake repellers in each pack, you could achieve a barrier of up to 30 mtrs- (see diagram). Perfect if your yard faces down to a creek or bushy area. The area contained in its circular protection zone is 1300 sq mtrs. 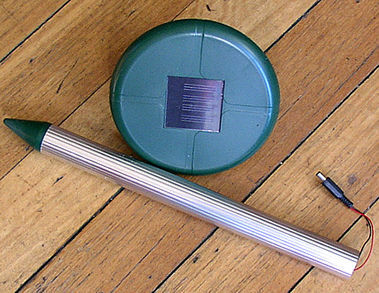 To get the best results for recharging the solar-powered batteries, ensure a location that gets maximum sun during the day. Snake Repellers do they work? Our primary reason for claiming our snake repeller works is that 100s have been sold and they never get returned. The "acid test" if you like, is that buyers are satisfied. If you spend time looking around the internet you'll find varying opinions especially amongst snake handlers. Primarily the skeptics say that its almost impossible to prove if they do or don't work. The idea of vibrations detering snakes is a logical one, but how do you test it? On YouTube there is a video of a snake handler dropping a snake next to a snake repeller and the snake being unfazed. However there are a number of problems with this demonstration, not the least of which is that the snake is only released for a very short time. Its unclear if the snake repellent device even got a chance to fire off. The snake was clearly used to being handled, and we didn't get a chance to see if over a few minutes it would choose to leave the area protected by the snake repeller. So, do our snake repellents work? Yes, but you should not see them as an impenetrable barrier; snakes defending territory, looking for chook eggs, or escaping a predator, would likely not be deterred by the repeller. Always be alert to the possibilty of snakes and do not be complacent in areas of high snake numbers! We wouldn't expect our grandchildren to be 100% protected from snakes in our backyard, and neither should you.